← What is River Restoration? I read Simon’s (a.k.a. @woodinrivers) great blog post on defining river restoration, and the differences between restoration, rehabilitation, re-creation and enhancement. er restoration in the academic literature, drawing a few conclusions and questions as I go. Take what you will from this rudimentary literature review! There have been 1246 academic papers with “river restoration” or “stream restoration” in the title published between 1973 and today (July 2013). We can see the terms starting to gather widespread use during the 1990s, as the practice of river restoration took hold. There has been a visible increase in papers since the 2000s, coinciding with the Water Framework Directive, peaking in the late 2000s. The general increase in published papers, likewise, must be treated with caution – research output in most areas is increasing, but it is interesting to see the relative dates of the “rise” of this term in academic papers, compared to something like hydrology, which rose in prominence in the 1950s. 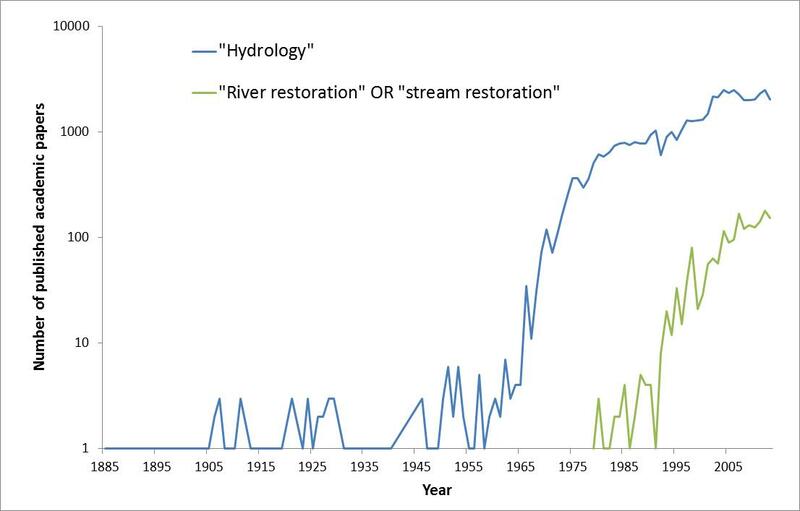 Scopus results of academic papers published with “river restoration” or “stream restoration” in the title, shown by year, against those with “hydrology” in the title for reference. 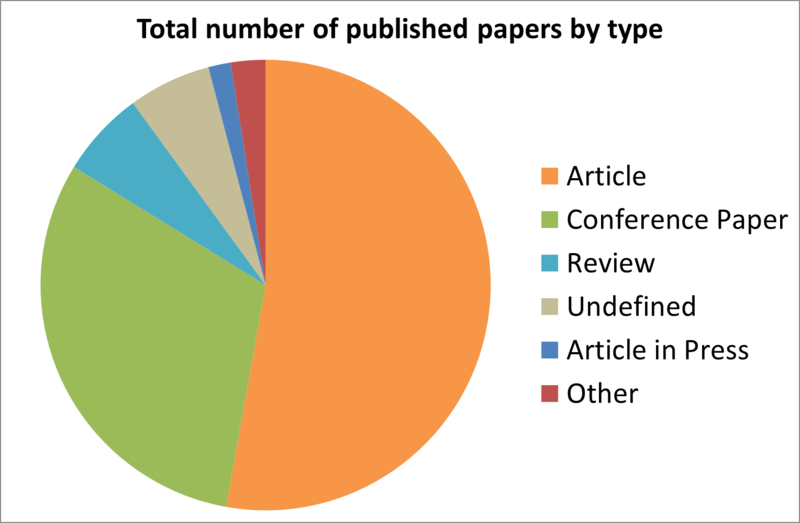 There has been a substantial proportion of conference papers among those published. We might speculate that conferences have been an important way to share experience of river restoration – perhaps reflecting the role of practitioners in this field of research, who are more likely published in conference proceedings than in academic articles. Scopus results of academic papers published with “river restoration” or “stream restoration” in the title, shown by paper type. 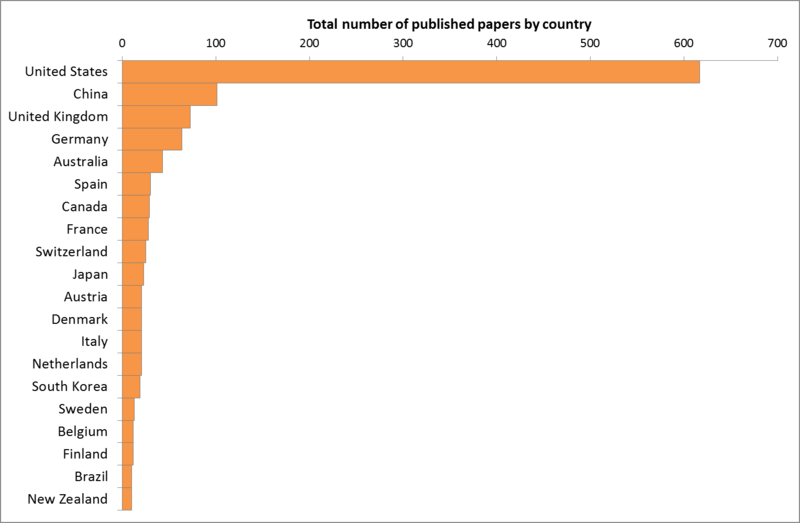 The US dominates the research output in terms of number of published papers, and this is fairly typical in most academic research. Often the UK comes up as the next biggest publishing country, but I am interested to see the amount of work coming from China. There may be much we can learn from the experiences there in mitigating major abuses of river systems in the past. Scopus results of academic papers published with “river restoration” or “stream restoration” in the title, shown by country of origin. What are the subject areas involved in publishing research on river restoration? Predominantly they are the environmental and natural sciences, with engineering maintaining a substantial share. It is interesting to see that, despite the important human (social, cultural, political) dimensions of river restoration and water management, the social sciences are not represented in greater numbers. It is also of interest to note that under “other”, subject areas include medical sciences (papers assessing effects of river restoration and associated water quality on public health, disease, and wellbeing). We might suggest that the breadth of subject areas reflects the inter-disciplinary nature of river restoration. 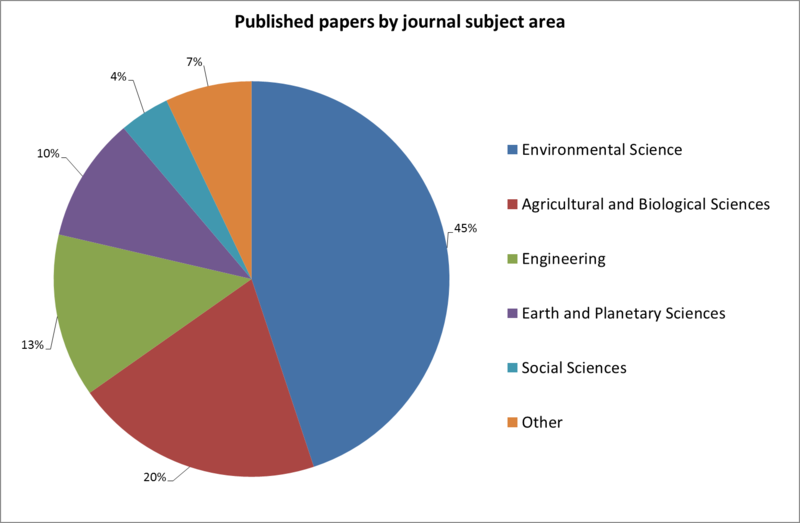 Scopus results of academic papers published with “river restoration” or “stream restoration” in the title, shown by subject area. Google Trends shows search patterns since 2004, suggesting a declining interest in river restoration. Can we take anything from this? Perhaps we might propose that the “golden age” of river restoration has now passed. Physical works to re-meander or re-grade river banks have fallen out of favour, owing to costs and a growing realisation that restoring the physical appearance of a river does not always equate to improved ecology, flood risk management, or sustainability. The bigger challenge is “restoring” the processes that underpin natural functioning of rivers, and with that must come acceptance of the inherent uncertainty and unpredictability of natural river processes, making space for them against competing land uses (both urban and rural areas “squeeze” rivers and their riparian and floodplain habitats), and developing a fully integrated, long term approach to managing them. —Edit note November 2013: graph showing number of papers by year changed to show alongside papers with “hydrology” in the title, for a useful illustration of the comparatively more recent rise of this field. This entry was posted in paper review, River Management, River restoration and tagged academic literature, river restoration, science. Bookmark the permalink.